If you see my flickr stream you will find a lot of flower photos. In some ways there are not too many things you can do to change up the standard shot. In lieu of having a macro lens, I have an approach for these extreme closeups– for me, I find this move in very close reveals details you might not see in the stand back shot of a set of flowers or even one. 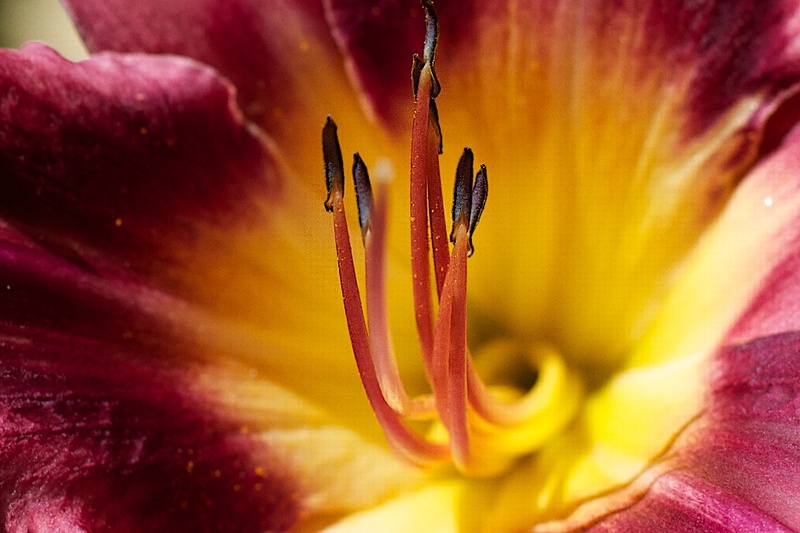 I did not even see all the detail of the stamen of these lilies until I went in tight. The original shot was maybe the whole flower, but I cropped it down to maybe 30% of the original size to isolate this detail. That’s about the entire technique. Of course getting a tight focus is important, using a single point focus, and picking it on the center of the flower. I also shot it at f/5.0 so the depth of field is not too shallow. I usually end up with 5 where the focus is not tight enough, but this one hit the mark, though I did brush in a tad more using the sharpen brush tool in Aperture. So my advice is rather than trying to get the whole flower in te shot, go closer, either with a good macro lens (still on ym wish list) or by cropping– of course the higher resolution original you have (mine are about 4000 px wide RAW images) the more you can get away with this.